Ot (Ѿ ѿ; italics: Ѿ ѿ) is a letter of the early Cyrillic alphabet. Though it originated as a ligature of the letters Omega (Ѡ ѡ) and Te (Т т), it functions as a discrete letter of the alphabet, placed between х and ц. This can be seen in the first printed Cyrillic abecedarium (illustrated), and continues in modern usage. 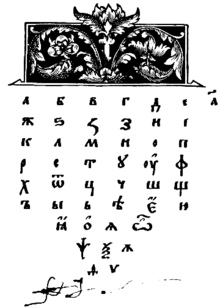 A page from Azbuka, the first Russian textbook, printed by Ivan Fyodorov in 1574. This page features the Cyrillic alphabet. Ot is used in Church Slavonic to represent the preposition отъ 'from' and prefix от-. It does not stand for this sequence of letters in any other context, nor can the sequence от be substituted for it where it does occur. It is used with a similar purpose in mediaeval manuscripts of other Slavonic languages written with the Cyrillic alphabet. In printed books ѿ is often used in preference to (ѡ҃) for the numeral 800. ^ Note that Ivan Fedorov’s alphabet does not include ѡ (though it does include ѽ). This is because it does include ѻ, which was considered orthographically equivalent; one may compare the alphabet from Spiridon Sobol’s abecedarium of 1631, which has ѡ where Ivan Fedorov has ѻ.